Today we introduce a mod that encourage exploration of the world of Minecraft, adding new biomes and modifications thereof. Highlands 1.7.2 and 1.7.10 is a mod which adds many more mountains and hills than usual. Also modifications or sub-biomes representing small areas within the same biome. Such as valleys, islands, small lakes, etc..
With this mod, won’t be only surface changes. Now under earth, land has increased the occurrence of certain minerals, depending on the biome, ie, in a biome find some increase in minerals (about twice). Find 40 new biomes, 12 new kinds of trees, emergence of villages and thousands more things. Start exploring! 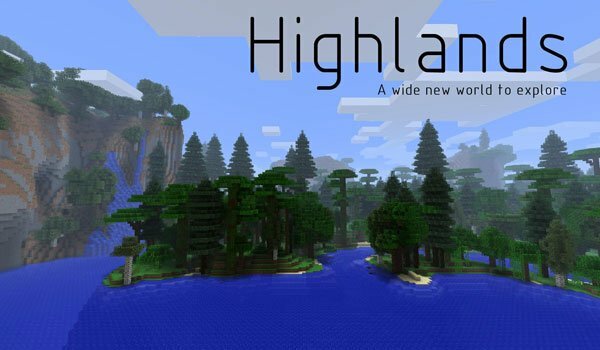 How to install Highlands Mod for Minecraft 1.7.2 and 1.7.10? New worlds most mountainous and new biomes!